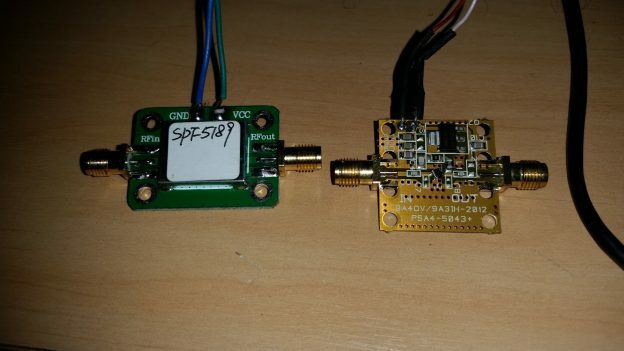 So I was talking with @luigi on OSP RocketChat and he noticed that one of the LNA’s I suggested alogn with the LNA4ALL (the SPF5189) got a comment on ebay saying that it doesn’t work on L Band. So that was weird to me, since I have 5 of them, and one currently in use with my GOES setup. So I decided to do a small and crude benchmark for L Band comparing no LNA with LNA4ALL and SPF5189. This entry was posted in English, Satellite, SDR and tagged Airspy, Antenna, GOES, Hearsat, HRIT, LRIT, NOAA, RTL SDR, RTLSDR, Satellite, SDR, Software Defined Radio on 14 de April de 2017 by racerxdl. The user of that link assumes all risks related to the use of their data and NOAA disclaims and any and all warranties, whether express or implied, including (without limitation) any implied warranties of merchantability or fitness for a particular purpose. So I kept my dish pointed to GOES-16 all over the week and did record the Monday testing (that contained CMI images) and recorded all files sent all over the week. Some of them are automatically posted on Twitter / Instagram by my OSP Bot but not all of them. I had discovered some issues with my Virtual Channel Ingestor on GOES Dump, and also most of the new data was not being handled correctly by Goes Dump. Working together with @usa_satcom we managed to almost zero-out the bugs in GOES Dump. This entry was posted in English, Satellite, SDR and tagged Airspy, EMWIN, English, False Color, GOES, GOES 16, Hearsat, HRIT, LRIT, NOAA, Open Satellite Project, OSP, Reverse Engineering, RTL SDR, Sat, Satellite, SDR, Software Defined Radio on 2 de April de 2017 by racerxdl. Few *times* ago I started to check on GOES 16 transmissions to see if I can get any data from it and make OpenSatelliteProject work with it. Me and @usa_satcom noticed that the HRIT signal was transmitting using differential encoding that was not predicted on NOAA’s HRIT Specification (You can check it here http://www.goes-r.gov/users/hrit-links.html ). So I decided to send an email to NOAA asking what was the current HRIT specs for GOES-16. Of course I expected no answer from them (they would probably be really busy with GOES-16 Testing), but surprisingly they answered sending the specs and saying that any feedbacks would be helpful and appreciated. 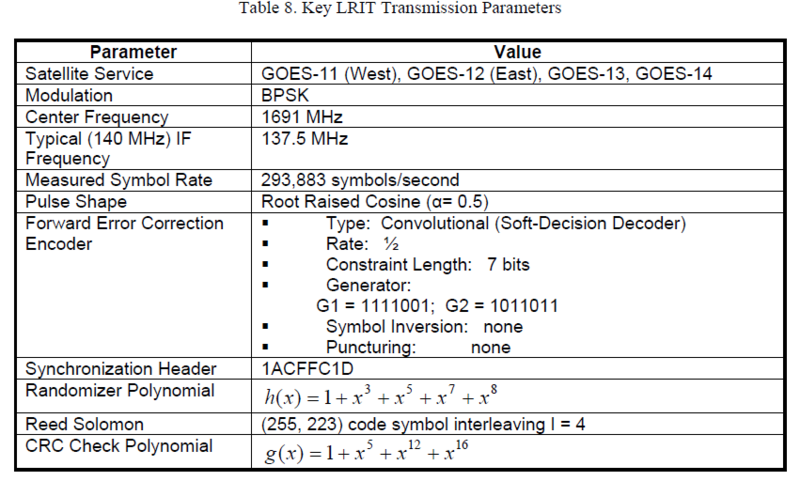 So the HRIT indeed uses Differential Encoding (NRZ-M to be more specific). Knowing that I could start changing OpenSatelliteProject to be compatible with HRIT. This entry was posted in English, Reverse Engineering, Satellite, SDR and tagged Airspy, Convolutional Code, Convolutional Encoding, EMWIN, English, GNU Radio, Gnuradio, GOES, GOES 16, GOES-R, GRC, HackRF, HRIT, LRIT, NOAA, Osmocom, RE, Reed Solomon, Root Raised Cosine Filter, Satellite, SDR on 25 de January de 2017 by racerxdl. 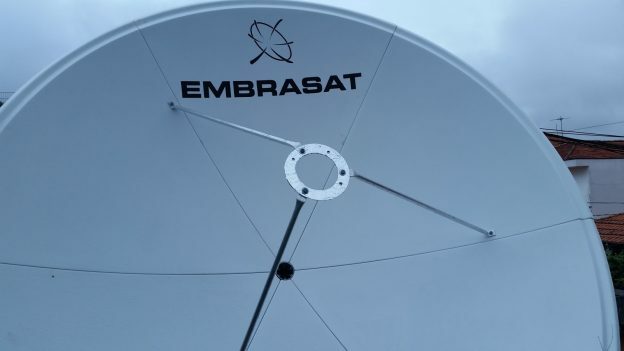 New 2.2m dish from Embrasat! It has been some time since I posted something here about my satellite projects. So now I finished assembling my new dish! 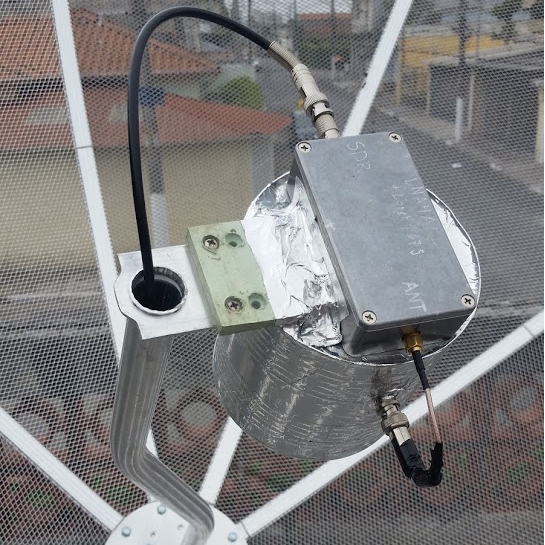 Previous (on GOES Satellite Hunt) I use a 1.9m TV dish that was cheap (R$200 or about US$70) and got really nice results (about 6dB SNR on LRIT and 10dB SNR on EMWIN). But I was willing to get the new GRB Signal from GOES-16 (previous named as GOES-R) that went up to Geostationary orbit last month. The GRB is the replacement for the GOES 13/14/15 GVAR signal. Basically GVAR is a rebroadcast of the partially processed data from the satellite. It is basically the raw sensor data packed in a format so the users can get and process by their own. The disadvantage of GVAR system over LRIT is that it does not have any error correcting methods. So either you have a very good signal, or you don’t have anything at all. The GRB signal that is on GOES-16 will send same raw data as the GVAR (actually it will send more data than GVAR, but thats another point) but now it will use DVB-S2, a market standard, for transmitting their data. Being DVB-S2 it does have error correcting like LRIT signal ( wikipedia has a good info about DVB-S2). But the bandwidth of GRB is much higher than LRIT and GVAR (LRIT is 600kHz wide, GVAR is 2.5MHz wide and GRB is 9MHz wide) so I would need a bigger dish to get a good signal. This entry was posted in English, Satellite, SDR and tagged 2.2m Prime Focus, Airspy, Antenna, Dish, Embrasat, English, Gnuradio, GOES, GOES 13, GOES 16, GOES-R, GQRX, HackRF, Hearsat, Linux, LRIT, Open Satellite Project, OSP, Prime Focus, RTLSDR, Satellite, SDR, Waveguide, Waveguide Feed on 16 de December de 2016 by racerxdl. In the last chapter of my GOES Satellite Hunt, I explained how to obtain the packets. 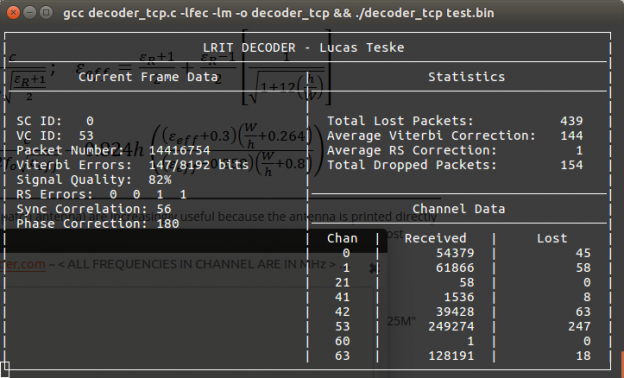 In this part I will explain how to aggregate and decompress the packets to generate the LRIT files. This part will be somwhat quick, because most of the hard stuff was already done in the last part. Sadly the decompression algorithm is a modified RICE algorithm, and the Linux version of the library provided by NOAA cannot be used anymore because of incompatibilities between GCC ABIs ( The NOAA library has been compiled with GCC 2). Until I reverse engineer and create a open version of the decompression algorithm, I will use the workaround I will explain here. This entry was posted in English, Reverse Engineering, Satellite, SDR and tagged AGC, Airspy, Automatic Gain Control, Bug, Compile, Convolutional Code, Convolutional Encoding, EMWIN, English, Full Disk, GNU Radio, Gnuradio, GOES, GRC, Hearsat, LRIT, Osmocom, RE, Reed Solomon, Reverse Engineering, Root Raised Cosine Filter, RRC Filter, RS, Sat, Satellite, SDR, Statistics, Viterbi on 7 de November de 2016 by racerxdl. In the last chapter I showed how to get the frames from the demodulated bit stream. In this chapter I will show you how to parse these frames and get the packets that will on next chapter generate the files that GOES send. I will first add C code to the code I did in the last chapter to separated all the virtual channels by ID. But mainly this chapter will be done in python (just because its easier, I will eventually make a C code as well to do the stuff). This entry was posted in English, Reverse Engineering, Satellite, SDR and tagged AGC, Airspy, Automatic Gain Control, Bug, Compile, Convolutional Code, Convolutional Encoding, EMWIN, English, GNU Radio, Gnuradio, GOES, GRC, Hearsat, LRIT, Osmocom, RE, Reed Solomon, Reverse Engineering, Root Raised Cosine Filter, RRC Filter, RS, Sat, Satellite, SDR, Statistics, Viterbi on 6 de November de 2016 by racerxdl. In the last chapter of GOES Satellite Hunt, I explained how I did the BPSK Demodulator for the LRIT Signal. Now I will explain how to decode the output of the data we got in the last chapter. One thing that is worth mentioning is that most (if not all) weather satellites that transmit digital signals use the CCSDS standard packet format, or at least something based on it. For example this frame decoder can be used (with some modifications due QPSK instead BPSK) for LRPT Signals from Meteor Satellites (I plan to do a LRPT decoder as well in the future, and I will post about it). I will not describe my entire code here, just the pieces for decoding the data. I will also not write the entire code here, since it can be checked in github. So before start see the picture below (again). We will some info from it as well. This entry was posted in Reverse Engineering, Satellite and tagged AGC, Airspy, Automatic Gain Control, Bug, Compile, Convolutional Code, Convolutional Encoding, EMWIN, English, GNU Radio, Gnuradio, GOES, GRC, Hearsat, LRIT, Osmocom, RE, Reed Solomon, Reverse Engineering, Root Raised Cosine Filter, RRC Filter, RS, Sat, Satellite, SDR, Statistics, Viterbi on 2 de November de 2016 by racerxdl. 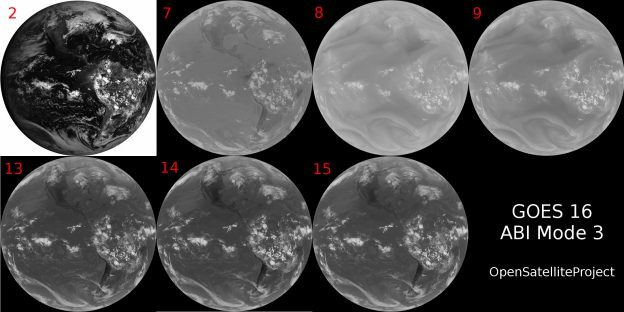 It contains basically all EMWIN data + Full Disks from GOES 13 and 15. This entry was posted in English, Reverse Engineering, Satellite, SDR and tagged AGC, Airspy, Automatic Gain Control, Bug, Compile, EMWIN, English, GNU Radio, Gnuradio, GOES, GRC, Hearsat, LRIT, Osmocom, RE, Reverse Engineering, Root Raised Cosine Filter, RRC Filter, Sat, Satellite, SDR on 30 de October de 2016 by racerxdl. 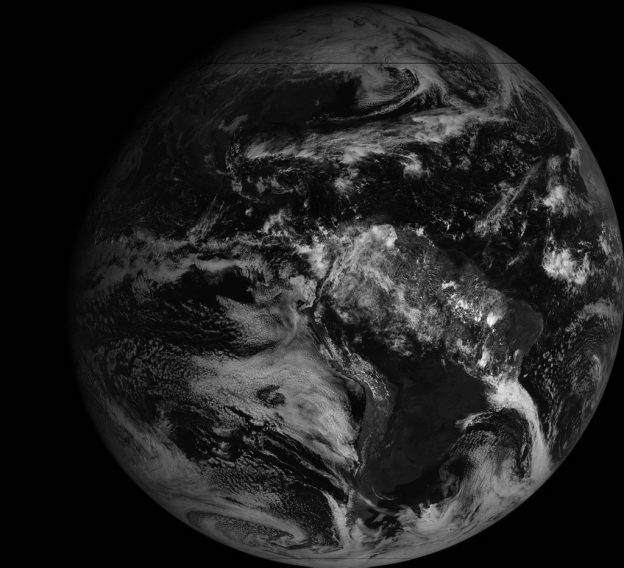 So I choose GOES over other Weather Satellites mainly because GOES is a Geostationary Satellite. That means its position never change. That was needed for me, because L Band usually needs a relatively big dish to capture the signal, and if the satellite is moving, the antenna needs to track it. That means: Alt-Az tracker (or something else) that will be most likely more expensive than the whole capture system (at least in Brazil). Since GOES does not move, I could just point my dish and forget about it. It would always capture the signal. This entry was posted in English, Reverse Engineering, Satellite, SDR and tagged Airspy, EMWIN, English, GOES, Hearsat, LRIT, RE, Reverse Engineering, Sat, Satellite, SDR on 18 de October de 2016 by racerxdl.